SKU: SIM-8302. Category: Apartment & Commercial Intercoms, Intercom Systems. Tags: apartment intercom, business intercom system, cell phone intercom system, commercial, front gate intercom, IP, ip intercom, ip intercom system, ip-based, MDU, mdu intercom, mobile phone apartment intercom, network intercom, SIM series, sim8302, video communication. 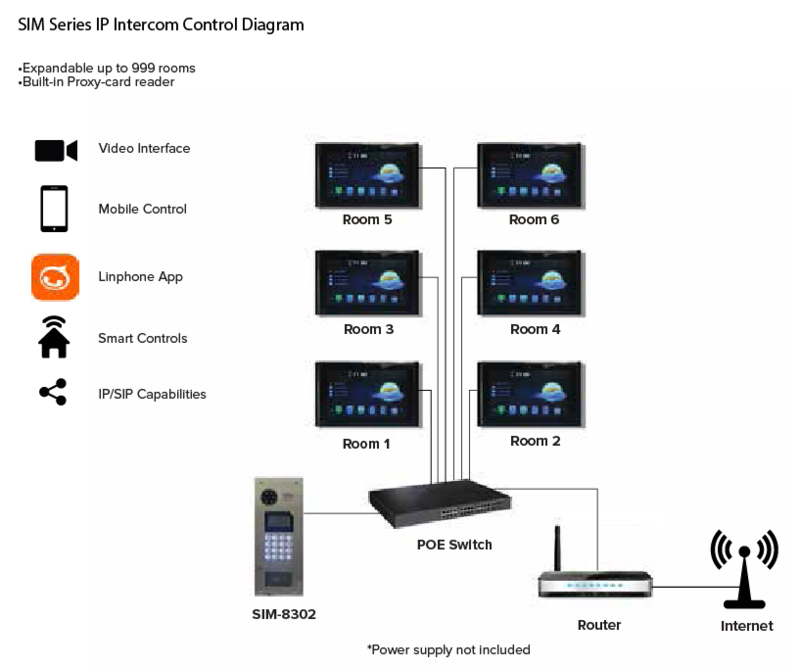 With its functional layout and contemporary design, the IP intercom system for Apartments, multi-dwelling units (MDUs) and commercial buildings has everything you need for streamlined access control for your residents. The new SIM Series IP intercom is equipped with a built-in IP camera, proximity card reader, keypad and LCD screen for a comprehensive resident directory and status notifications. The Sim Series intercom is compatible with the Channel Vision IP touch screen room stations, Grandstream, RTI and others. Touch screens are available in 4.3″, 7″ or 10″ screens and feature video communication and control of the front door. Can the IP Touch Screen available in flush mount? Can I control the touch screen externally? Yes; users can download the Linphone app in order to control the touch screens from anywhere in the world with an internet connection. Linphone is a free service and has been battle-tested with the IP touch screens. It can be downloaded for Apple™, Android™ and Windows™ devices. Can I shut down the monitors externally? Yes; users can shut down or put the touch screen to sleep from the Linphone app.